I stand, along with three other volunteers, watching one of the Elephant Nature Park’s veterinarian’s squirt antiseptic into the mangled foot of Sri Prae. It is purple, covered in medicine to keep it from getting infected. And, it’s disfigured, partially blown off after accidentally stepping on a land mine years back when she was in the illegal logging industry in the Tak province of Thailand. The results from stepping on a land mine in Tak province of Thailand. The first time I saw her foot, I winced. But now, after a few days of staring at it, the sight of the purple and the bit missing don’t bother me anymore. Today, on our second-to-last full day at the park, four of us are shadowing one of the park’s vets, a young Thai, who not only cares for the injured and sick elephants, but also all of the park’s other animals, including a rabbit with a skin condition thanks to the humidity and rain, a horse who was hit by a car and now has a prosthetic leg, and other creatures. After a morning mushing overly ripe bananas and fashioning banana balls for the senior elephants, re-organizing some of the tons of ready-to-eat bananas and delivering food to the feeding platforms, it’s time to spend a couple of hours with the vet. We meet at the green medical hit to gather vet supplies before we embark on the rounds. The hut is where the two victims of land mine explosions — Sri Prae and Malai Tong — spend the rainy season. The two can’t risk infection on the soppy, overly saturated ground so the shelter is their home during the wet days. 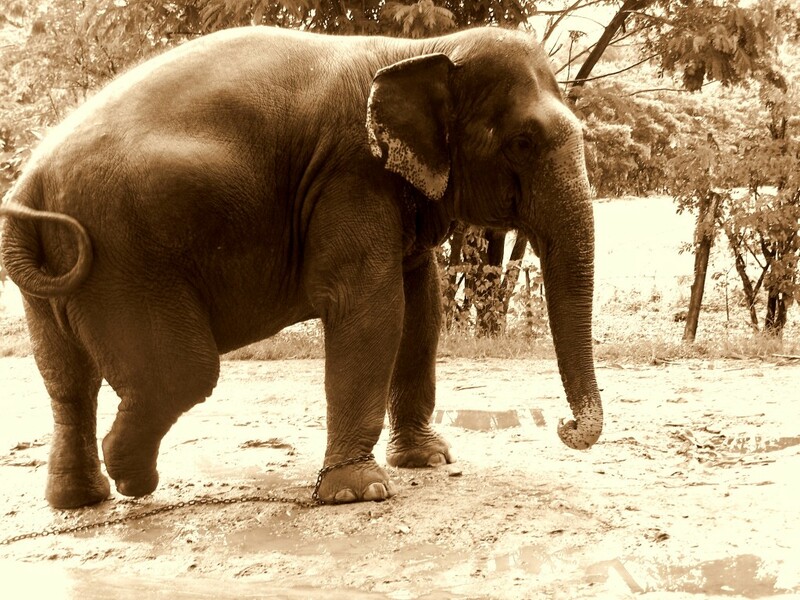 Sri Prae stands calmly, flapping her ears and lightly swinging her truck around looking for food. Malai Tong doesn’t put weight on her injured foot. Malai Tong is the opposite. She’s missing a portion of her back foot and it dangles as she shifts her weight from front foot to front foot. She sways, looking agitated. These two girls are fortunate elephants — although their feet are no longer whole from the blasts, they have come out relatively unscathed. Sadly, a couple of hours away, at the Elephant Hospital in Lampang, there is a male elephant who isn’t as lucky. He’s fighting for his life after stepping on a mine when he crossed the border into Burma/Mynamar the week before. One of the volunteers journeyed to the hospital earlier in the week to see how his treatment was going. When she returned and I spoke with her, she was visibly shaken and reported heart-breaking stories of the injured elephant. 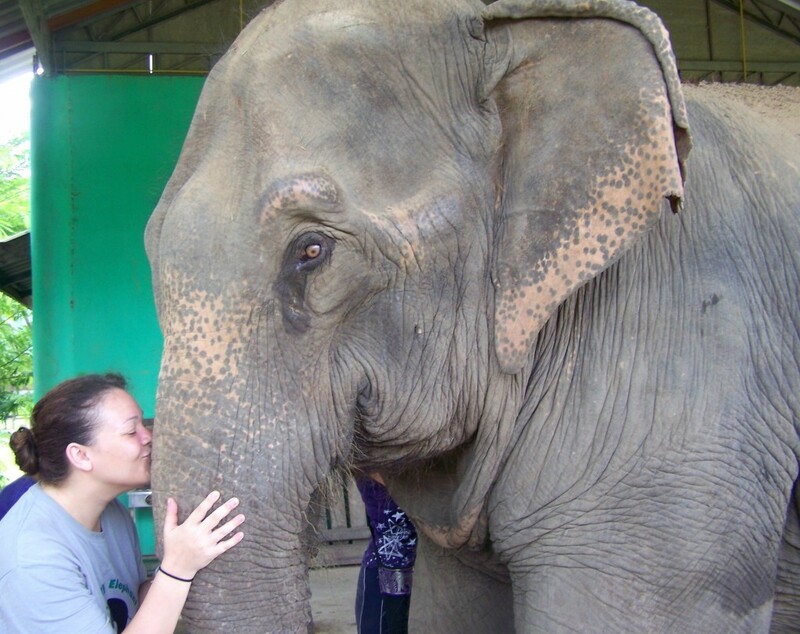 We start our rounds with Mae Tee, the first elephant I met at when I arrived at Elephant Nature Park. Armed with a bucket filled with gauze, antiseptic and other necessary instruments, the vet crouches down low, next to her foot. The vet cares for Mae Tee. It has an ongoing abscess from her days trekking, and it needs to be cleaned. He sticks a giant swab of cotton into the wound, and then pulls it out the other end. Normally, I can’t handle watching something like that. Yet, today, when he moves the cotton up and back in the wound, pulling it through the two openings in the abscess, my eyes are glued. She stands there quiet, not moving. I guess she’s used to being cared for. Then, we return to the medical hut to clean up Sri Prae and Malai Tong’s feet. Today is their last day under the shelter, tomorrow they are free to leave. 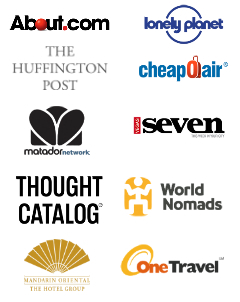 For Malai Tong, that’s great since she has a little family that has been created. Sri Prae hasn’t made any friends yet, so there’s hope she will begin to at least make a girlfriend once she is released from treatment. Smooching the leathery trunk of Sri Prae. As the vet cleans her foot, the four of us stand in front of her, stroking her trunk, scratching the side of her face, feeding her fruit. I even sneak a kiss on her trunk. Then, it is on to Malai Tong. Nearly on cue, she crouches down and lifts up her back foot so the vet can clean it out. 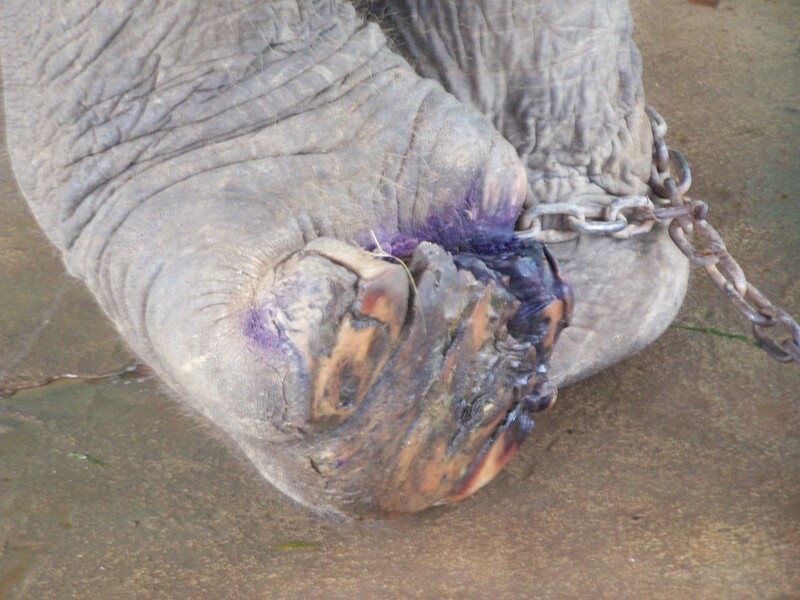 Malai Tong doesn’t need much coaxing to kneel down so her wound can be cleaned. “Do you want to try?” he asks us, handing off what used to be a part of a Super Soaker but is now a used to clean wounds. One-by-one, we dip the plastic squirter into the bucket and then release the liquid onto her foot. She sits perfectly still, letting each of us care for her as she dips her trunk into a bucket of food in front of her. 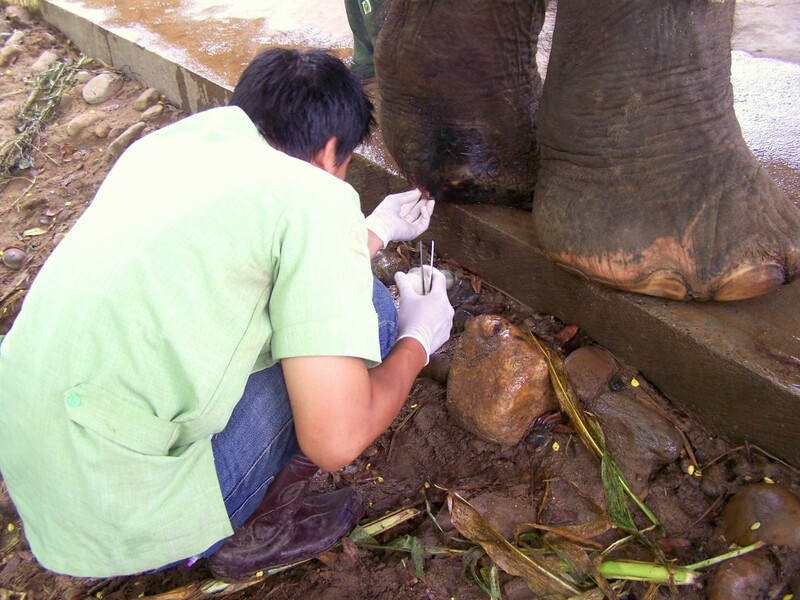 A volunteer helps clean Malai Tong’s foot. It amazes me how willing she is to be cared for, even if she is being bribed with whole bananas and watermelon halves. When we finish with her, we all gather together and help the vet fold gauze, then it’s time to go. Walking back towards the compound in the mid-afternoon, the sun’s rays creep out from behind the gray for the first time since I’ve been here. I turn around and survey the scene. Everything is glistening, light bouncing off of the rain-soaked blades of grass. I smile to myself, thankful for every moment I’ve had thus far at Elephant Nature Park. Wow Diana that looks awful. I just had a friend post on Facebook that she was off to Thailand and people told her to get a photo on an elephant and I forwarded your post and told her the chances of the animal being treated well was slim to none, I hope in time more people understand this. It isn’t a pretty injury, but she handles it well. 🙂 I appreciate you helping spread the word about elephants and why people shouldn’t ride them!! It is sad, but fortunately they are treated very well at Elephant Nature Park. Why oh why didn’t I become an elephant vet??? Haha!! Me too!!! My new thing is I want to be a mahout! Oh man. That made me shed a tiny man tear (and those don’t come easy). What a noble cause and fantastic volunteer project. Thanks for letting us know about it and also about the dangers elephants still face from land mines. Awww … love that you can admit you shed a tiny man tear. 😉 It was an amazing opportunity and one I cannot wait to do again in the future. Well, you should come with me to ENP next time I go!!! Maybe you’ll get even more inspired. 🙂 They are pretty awesome. I heard among people that elephants were treated poorly in places you go could have your picture taken with them etc… but did not know the extent of it. Danni – I have written a lot about Phajaan and working hard to spread the word. The torture is probably one of the most horrible things I have ever learned about. There are. Especially at the border of Burma/Mynamar. This is so sad. But it is good to know that there are people taking care of these elephants. Ha ha!! Good thing she isn’t going to see it. 🙂 It was very heart-warming to be able to spend time with people who care so much for these animals. I was surprised they so easily accepted treatment. If only our pets would do that! Mae Tee looks HUGE!! How do they get the elephants to kneel? The photos of Sri Prae are stunning! I have no idea how they got her to kneel. I think it’s just one of those things that comes with time and positive reinforcement. Kneeling = a big bucket of fruit. 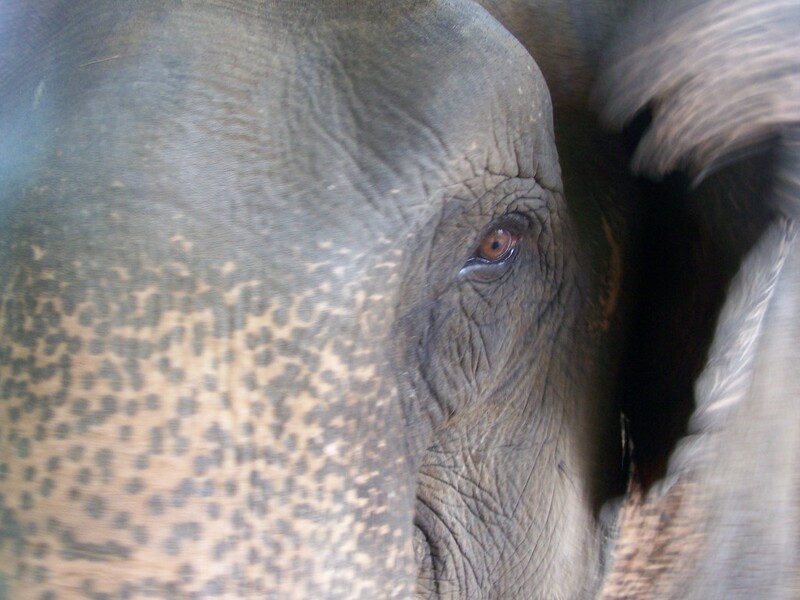 Sri Prae is a stunning elephant — thank you!! What a terrible tragedy. Fortunately, there are those kind enough to take care of abused animals. The landmine victims definitely are gruesome, but also inspiring. They’ve overcome obstacles and are doing really well!